Mike and Valli on Sanctuary filled us in on the action at the dock last night while we were at the movie. It seems that crowds of people kept coming and going from two tiny houseboats on our dock with curtains on every window. One person even delivered small packages to cars that would drive by. We can only guess what was going on there. There was a little fog on the river leaving Ditto Marina in Huntsville but we had no problem seeing the buoys. The Delta Queen paddlewheel cruise ship was docked at Decatur. Thousands of small black ducks were resting in the river as we passed the Swan Creek Wildlife Management Area. 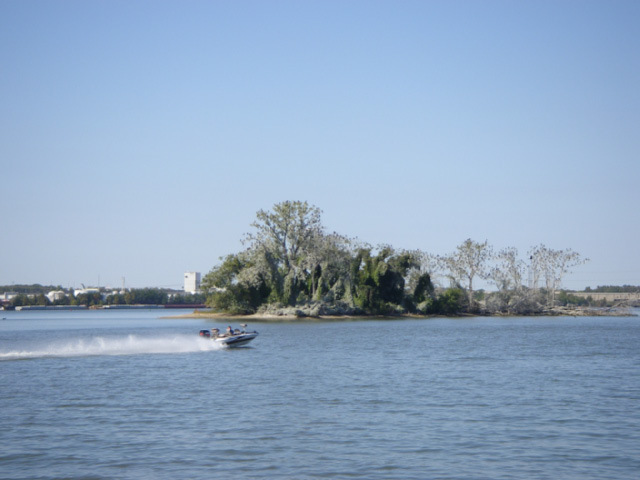 The photo is of a small island west of Decatur that has been taken over by cormorants and kudzu. It looks like something out of the Lord of the Rings movies. We were at Joe Wheeler at 1:15pm and came in with 3 other boats. Docking was very efficiently handled. We were thankful that we had moved from #12 on the waiting list to #1 and were assigned a slip. Four boats were already at anchored in the harbor. This is the biggest boating event ever in this part of the country. There will be 64 boats and 225 people attending the event. Cell phone service is marginal so it may not be possible to update the blog every day.